Boat shoes are both stylish and utilitarian. 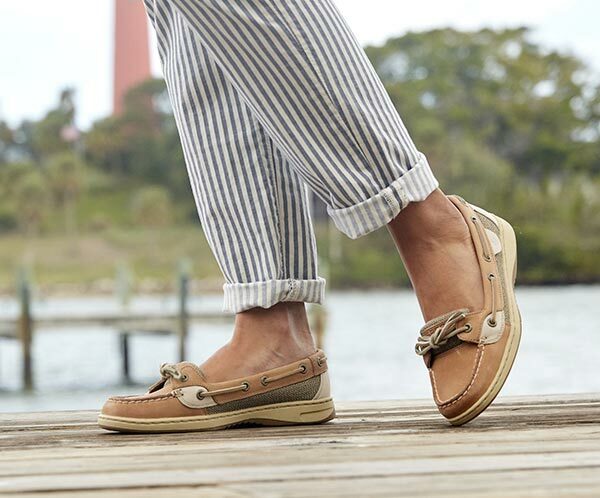 Boat shoes, also known as top siders and deck shoes, had purely utilitarian beginnings, but are now considered fashionable footwear for both men and women. Mentioned in The Official Preppy Handbook, they became quite popular in the 1980s. Due to their unique construction and design, they have remained a great choice of shoe for the summer months. Part of wearing boat shoes correctly is using the most appropriate accessories. For women, floral bags and scarves are great options to pair with deck shoes, as such shoes are menswear-inspired and subsequently not very feminine. Therefore, adding girly touches is a great way to make them work with any casual summer outfit. Something that is considered an advantage by both men and women is the fact that boat shoes can be worn without socks. This is especially beneficial if you plan to wear them at the beach or by a pool where you may want to transition to a barefoot state without any hassle. Jeans, denim skirts, clam diggers and shorts are always appropriate when paired with top siders, and essentially any color goes. Affordable and easy to wear, these stylish, comfortable shoes are a must-have this season. Buy several pairs in different colors to ensure you always have the perfect choice on hand for a casual summer day.